During the project, we were requested by various producers (Hydrographic Offices) to test transfers and uploads of their S-102 data sets. This would give us a great opportunity to gain even further experience with regards to the upload checks already made, and as such decided to support their request and include it as a part of the testing. In addition, we hoped this would stimulate and motivate future production and deliveries via PRIMAR. We also wanted the opportunity to make producers aware of the challenges associated with the production of S-102 datasets. This in turn could relate to the needs of the additional effort required to start producing the new data format, production tools readiness etc. To date, we have received data from 7 different produces, in addition to the Norwegian Hydrographic Service. During this period, it became apparent that several of the HOs did not have available or updated production tools, nor much experience with the data format. In some cases, this led to several rounds of checks taking place, before appropriate dataset could be uploaded in the test database (without being automatically rejected by the automated upload checker). The Norwegian Hydrographic Service provided several dataset for the project, these were uploaded into our VPN test system. 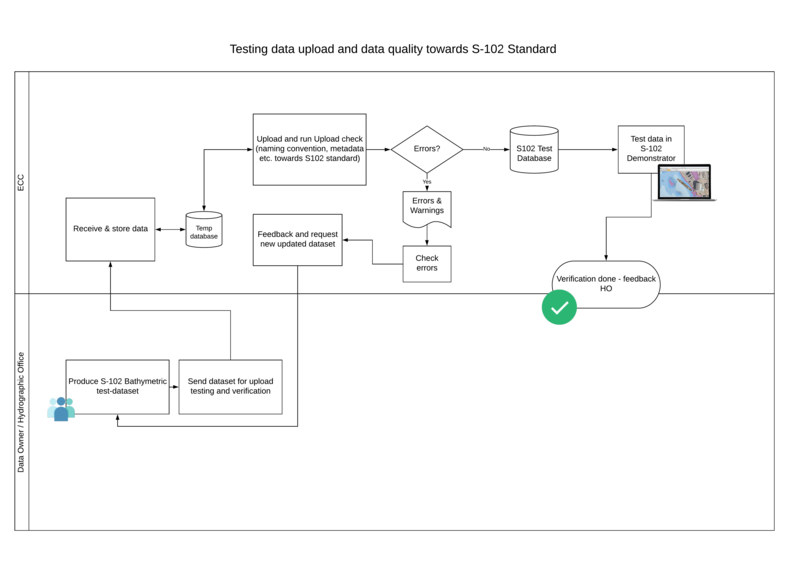 During upload, the data undergoes a set of automated upload checks (for more information see the Data Quality section). The S-102 Demonstrator has been developed with its own interface connecting directly to the data in the VPN test system. Define UTM zone to be applied. WCS-server providing elevation data for land areas. WMS/WMTS-servers providing pictures covering land areas. WMS/WMTS-servers providing ENCs for Sea areas (PRIMAR/ECC S-57 server can be used). WMS/WMTS-server providing coastline. Alternative could be shape-file delivery. 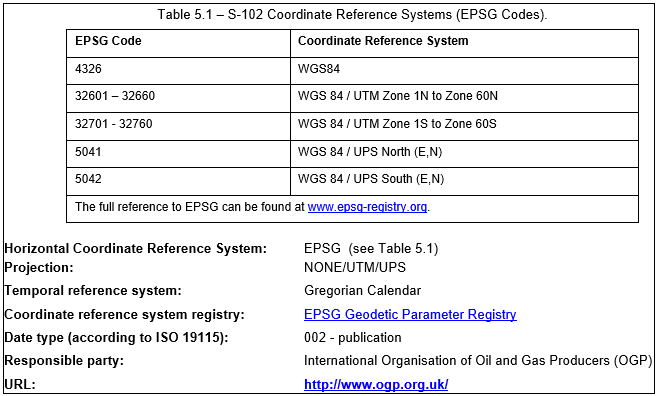 Related to previous data deliveries, we experienced that the use of coordinate reference systems and datum is not always consistent and can vary between producers, with several producers supplying data in their own local datum (specific to producer nation). This led to error reports from the upload checker and the upload was automatically stopped. Through guidance and dialogue with the producer, data has now been produced according to the limitations specified in S-102 Draft version 2.0.0. The producers have gained valuable experience about the possibilities of producing their data and any limitations in their production tools. For example, errors discovered in production tools during test data production. Future delivery model of S-102 data should be based on direct uploads, where the producer loads data directly to the PRIMAR database (where automated upload checks are part of the upload process).